In the Broadway musical Hamilton, George Washington tells Alexander Hamilton, “You have no control … who tells your story.” In archives and special collections, stories are preserved and told every day, whether they are the stories of presidents and politicians or those of everyday people. While the Special Collections Research Center is better known for its collections documenting modern day people and events, we do hold some materials related to our founding fathers, including those represented in Hamilton. 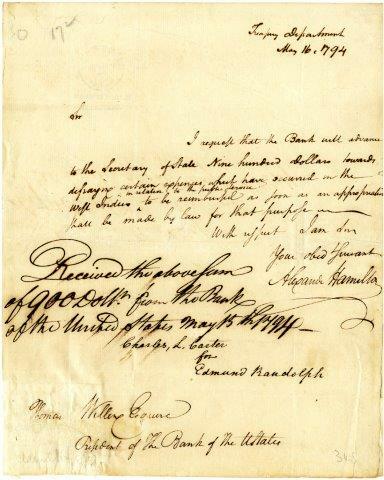 Alexander Hamilton’s own handwriting can be seen in the original 1794 document “Order on First Bank of United States,” which shows Hamilton in his capacity as Secretary of the Treasury authorizing the Secretary of State, Edmund Randolph, to be paid $900 for “certain expenses which have occurred in the West Indies in relation to public service.” His work is also represented by his publication The Soundness of the Policy of Protecting Domestic Manufactures (Philadelphia: printed by J. R. A. Skerrett, 1817). Eighteenth century printed materials in SCRC demonstrate that the personal attacks shown in the musical were just as vindictive in real life: the pamphlet Letters to Alexander Hamilton, King of the Feds (New York: orinted by Richard Reynolds, 1802), attributed to expert scandalmonger James Thomson Callender (the man credited with revealing Hamilton’s affair with Maria Reynolds), attacks Hamilton for 64 pages. Multiple books in SCRC detail the life and death of Hamilton, including Gertrude Franklin Horn Atherton’s The Conqueror: Being the True and Romantic Story of Alexander Hamilton (New York: Macmillan, 1902) and William Coleman’s 1804 publication A Collection of the Facts and Documents, Relative to the Death of Major-General Alexander Hamilton (Boston: Reprinted by Houghton, Mifflin and Company, 1904). Aaron Burr’s troubles did not end after he killed Alexander Hamilton in an 1804 duel. In 1807 he was arrested for treason at the behest of President Jefferson. 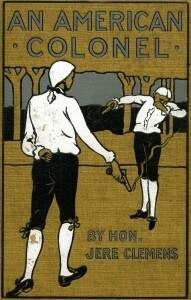 The trial is extensively detailed in the two volumes of Reports of the Trials of Colonel Aaron Burr (Philadelphia: published by Hopkins and Earle. Fry and Kammerer, printers, 1808). For Burr apologists, the book An American Colonel: A Story of Thrilling Times During the Revolution and the Great Rivalry of Aaron Burr and Alexander Hamilton, by Jeremiah Clemens (Akron, Ohio: Wolfe Pub. Co., 1900) tells the story of Hamilton and Burr’s rivalry in pro-Burr fashion. 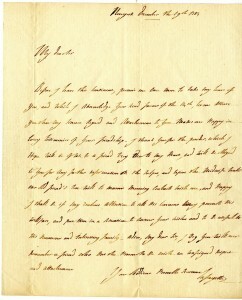 Marquis de Lafayette letter to “My dear sir,” December 19, 1784. 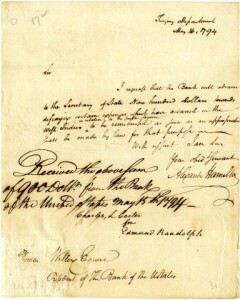 Jay Edwin Sturgis Nagle Papers. 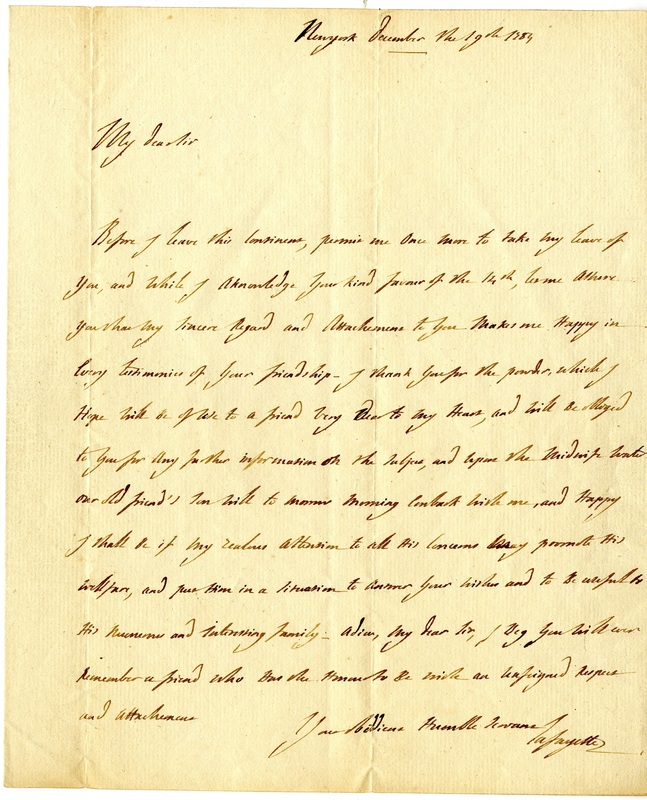 Marquis de Lafayette is represented in SCRC collections by a handwritten 1784 letter from the Jay Edwin Sturgis Nagle Collection, as well as multiple printed eulogies given upon his death in 1834. An unusual take on the Marquis is given in Walt Whitman’s short publication, Lafayette in Brooklyn (New York: George D. Smith, 1905), in which he describes being picked up and kissed by Lafayette as a small child. 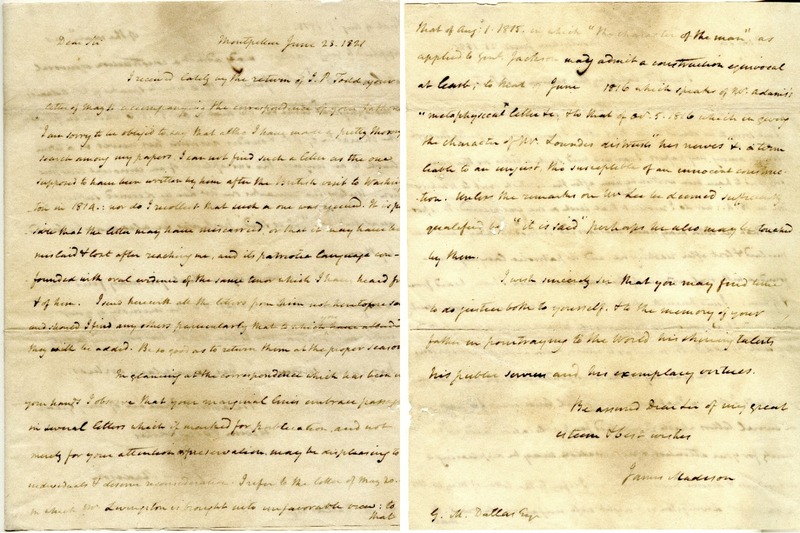 Thomas Jefferson, of course, is well documented in many resources, including two letters from the Alexander James and George Mifflin Dallas Papers. SCRC also holds an early edition of Jefferson’s only full-length book, Notes on the State of Virginia (Philadelphia: R.T. Rawle, publisher, John Thompson, printer, June, 1801). The Dallas Papers also contain one letter by James Madison. 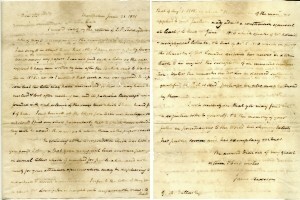 George Washington, like Jefferson, is extensively documented. One particularly beautiful Washington-related book is an 1858 publication of his farewell address upon his retirement from the presidency–the basis for the song “One Last Time” (Washington’s Farewell Address to the People of the United States: Embellished with Arabesque Designs & Illuminations. Philadelphia: Devereux & Company, 1858).